july is national ice cream month. let's celebrate with homemade ice cream! 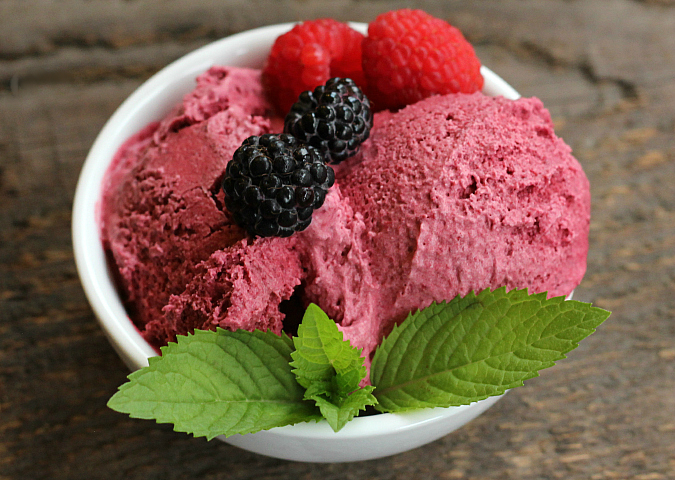 we have a ton of berries in our refrigerator from when we went berry picking this past weekend, and one of the things we made with our berries was ice cream! 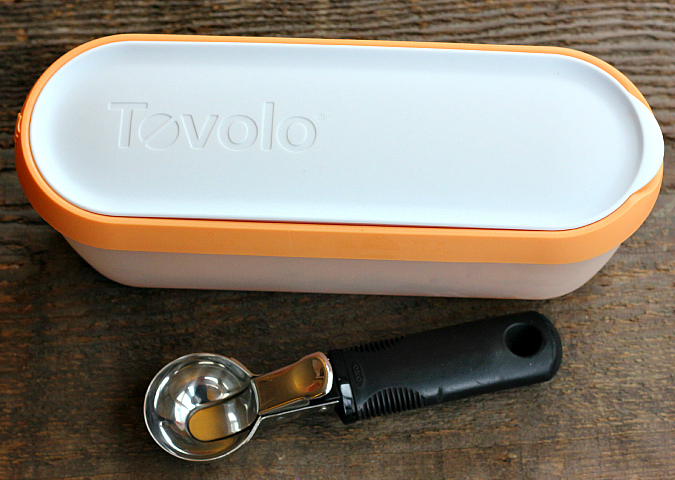 a few months ago we bought this tovolo glide-a-scoop ice cream tub and i have been excited to use it ever since. i finally got a chance to use it for the first time with this batch of ice cream and let me tell you, i love it! summer desserts that incorporate fresh fruit can't be beat. they're extra good when you know you picked your own fruit! 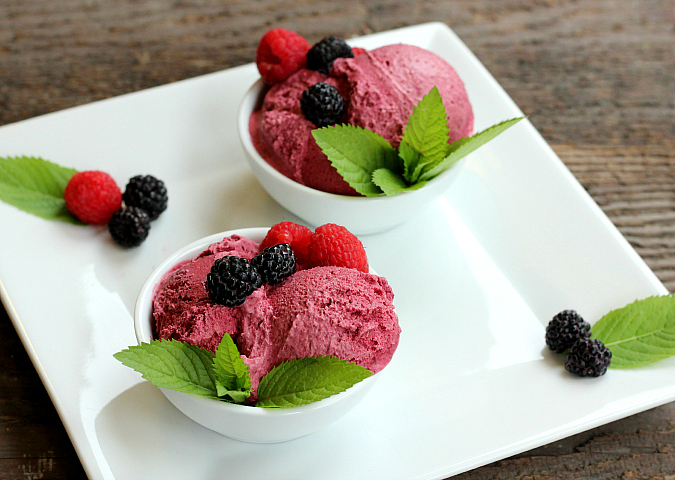 we combined the red raspberries and the black raspberries for a double raspberry dessert that is absolutely amazing! 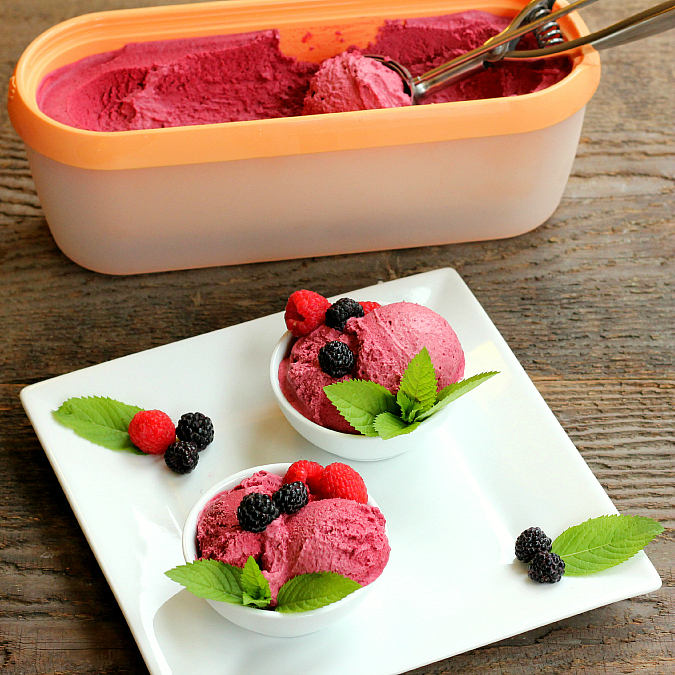 this double raspberry ice cream is so easy to make. 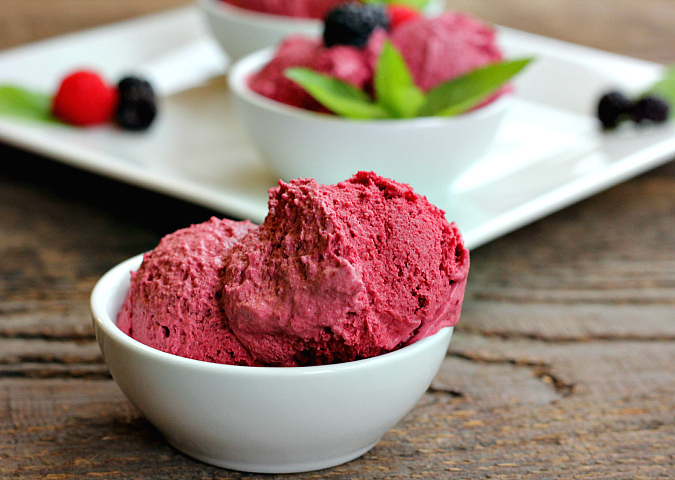 it doesn't have any crazy ingredients or chemicals like store-bought ice cream. take a look at that gorgeous vibrant pink color! that is all natural, my friends. no food coloring here. the texture of this ice cream is velvety smooth. it is rich and creamy, and it is a decadent treat for sure! puree the raspberries in a blender until smooth. press the pureed berries through a fine-mesh strainer to remove the seeds. set aside. in a bowl, combine the eggs and sugar. beat with an electric hand mixer until thickened and pale yellow. set aside. in a medium saucepan bring the milk to a simmer over low heat. gradually whisk the warm milk into the egg mixture. return the entire milk-egg mixture to the saucepan. cook over low heat, stirring constantly, until the mixture is think enough to coat the back of a wooden spoon. strain the mixture into a large bowl. let the mixture cool to room temperature. once cool, stir in the whipping cream, vanilla, and strained berry puree. refrigerate until completely cold. 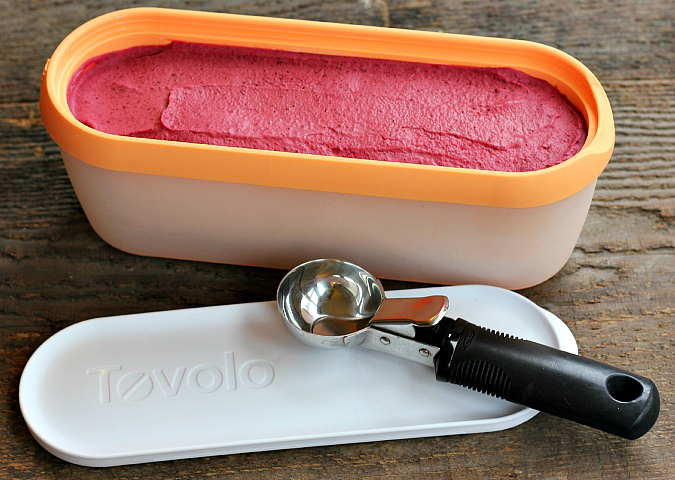 once cold, pour the mixture into an ice cream maker and freeze according to the ice cream maker's instructions. let the mixture mix in the ice cream maker until thickened (about 25 minutes). 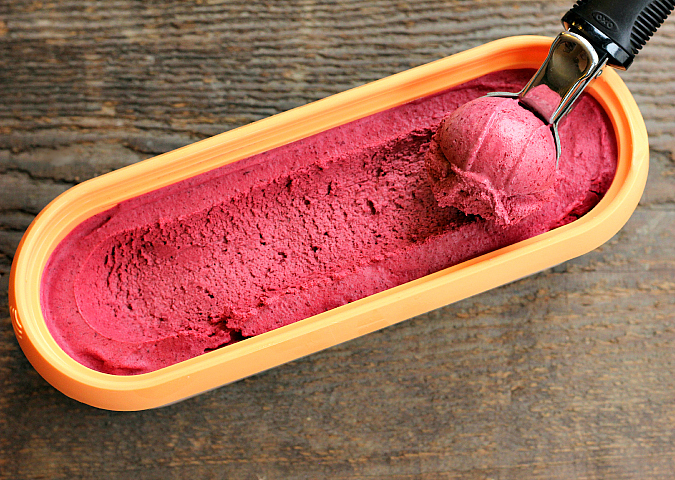 remove the ice cream from the ice cream maker and transfer to a freezer-safe container. freeze until completely set (about 2 hours) before serving. The ice cream looks delicious and the photos are beautiful! Boy, does that look tasty. Pretty color too. I will be up for dessert. Love the ice cream container.